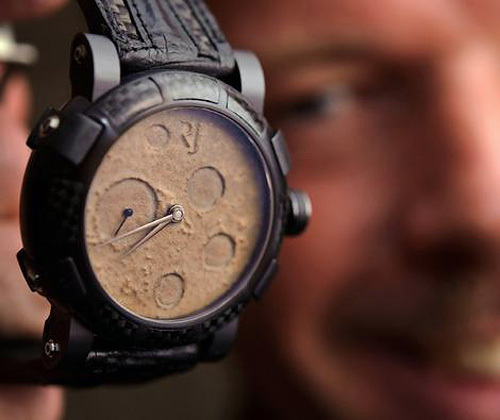 Romain Jerome's Moon Dust-DNA Collection | OhGizmo! In its continued efforts to set itself apart from the hundreds of other watchmakers that feature the Swiss brand stamp, Romain Jerome has once again come up with a watch that’s less about the design, and more about what goes into its construction. While their Titanic DNA line used pieces of steel and coal from the famous shipwreck, their new Moon Dust-DNA collection is made of steel from the Apollo 11 rocket, fibers from a spacesuit worn aboard the International Space Station and dust from a moon rock that was collected during our first visit. The company plans to make just 1,969 of the watches, to commemorate the year Buzz and Neil took their first historic steps on the moon, but for the rest of us, the watch is probably the closest we’ll ever get to being there. The watches start at just $15,000 which is surprisingly affordable given Romain Jerome’s past creations, but certain models will cost as much as $500,000, which seems more appropriate.